Gun Cleaning Kits - What do you use? If you look on eBay you'll see a gazillion "kits". Are these kits really necessary? I'm trying to get ideas on what I really need and what is a waste of money. I own one 12 gauge shotgun (just got) and one Ruger 10/22 coming soon. I will also have a small pistol in time. I'm fairly new to gun ownership and do not have any cleaning tools yet. What do you recommend? A whole "kit", or purchase items that I really need separately? Please provide any links if you can so I know what you're talking about. Ive used gun specific kits and as my collection grew so did my needs, so I went to Otis Technology route. 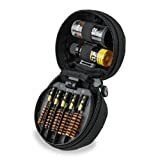 One kit gives me everything I need to clean .17hmr all the way up to .50BMG to .410 to 12gauge, its compact and neat organized and just handy. At a $140 it might have the inital sticker shock, I feel it is worth every penny though. You buy this once and never need another cleaning kit agian for other firearms you may acquire at a later date. I use Hoppes #9 solvent and CLP lube for internal gun parts cleaning and lubing. I don't really like "kits", so I built my own. For my "home" kit, I keep all of the accessories in a tackle-box. You need a cleaning rod that fits the bore as closely as possible (I like Dewey and Tipton). You'll obviously also need caliber specific bore brushes, jags or patch eyelets. Buy patches that are for your bore size. I also use pipe-cleaners and q-tips a good bit. For solvents, you need a plain "powder" solvent for general cleaning and a copper solvent for use in removing copper build up in the bore. For a gun lubricant I use 10W-40 Royal Purple synthetic motor oil for 3 seasons, and in the heat of summer I use wheel bearing grease for the frame rails and barrel lock-up points on my handgun barrels. http://www.deweyrods.com/ They are renown for their teflon coated cleaning rods. I usually go about 10 inches longer than the length of your barrel. Oil and bore solivant, this one is of personal preference, I use Montana extreme copper solivant because its harsh, but unlike other solivants it uses ammonia. So if you leave it in the bore a little to long then it will start to gel up instead of eat away at your rifling. For your shotgun this is a good kit, but you again need oil and solivant. For cleaning procedures I use this as a guide and have for years. Let me know if the link doesn't work for ya. I have Permatex 80345 white lithium grease in my cleaning kit. I used to use Tetra gun grease. Permatex seemed to be more slippery than Tetra. Permatex 80345 is used for metal-to-plastic applications, and would seem better for my poly frame guns with the cast slide. Protects against rust, aids drastically to reduce friction between surfaces, and is formulated to withstand moisture and high heat. Tetra is $4.99 for 1 oz, and Permatex is $2.89 for 1.5 oz. I use a cleaning rod with appropriate tip, cloth cleaning pads, Windex and WD-40. I save the cleaning solution that comes with the Otis kit for if I really need it and use Hoppes bore solvent, Hoppes Gun Cleaner, and Hoppes Gun Oil. I too have an Otis kit as mentioned above, but also piece together single items. A few toothbrushes, dental tools, short single metal rod for pistol cleaning, many calibers of brushes (more beyond just what calibers I own for prepping purposes), pipe cleaners, patches, and a few different lubircating oils. I also have found the Hopps brand solvent works really well. I have a Otis, Law Enforcement Kit for my range bag; it'll clean 5.56, 12 gauge, 9mm, and 45 with ease. For home I have a kit that I custom build in a tackle box. I usually start out buying just an all around kit and add what I like, throw away what I don't. I prefer brass jags, and patch holders, and all the off the shelf kits come with nylon. I also like to have multiple rods for my kits, as I hate changing out patches and brushes constantly, and having one rod for patches, and one for brushes really shaves down the time it takes me. Nylon brushes are a must in my kit as well. Love them for really getting in there and getting all the crap out. I use Hoppes No.9 and Rem oil, or Shooters Choice grease depending on time of year and how long the guns will be stored. I really like the grease for my 9mm, been using it for years and it's cleaner and the slide operates flawlessly. For my mini, just a fine coating of Rem Oil seems to be working good so far. Course I'm always open to trying new things. Otis like above and bore snakes. I like remington gun oil for the outside and bore snake bore cleaner or otis bore cleaner. Bore snake in each caliber, RemOil wipes, and AP brush.. Literally that is all I have used in combat, garrison, and on my personal weapons for 6+ years now. Before RemOil wipes it was baby wipes. Granted this comes with a few pre-reqs, I never fire corrosive ammo, I clean immediately after I shoot and at LEAST once a week whether I fired or not. and I wipe my carry piece down every night before bed.. this is for M16, AR15, M9, 1911, M249SAW, M240B, ect. It is helpful to have a screw driver set and cleaning rods but that is literally everything I have ever needed in a weapons cleaning kit. I use Hoppes or RemOil dry teflon lube for everyday weapons lubrication for any non FA weapons and Break Free for any FA weapons. Oh and Hoppe's #9 bore solvent. In the field I like the Otis kits. Another worthy one are the inexpensive Patchworms. Both are pullthrough systems that can handle multiple calibers. And unlike the Bore Snakes, aren't prone to breaking in the bore and sticking hopelessly. At home I use 1 piece stainless rods. Wow, thanks for all the information! I'm going to go through all this and find a common solution. So glad I found this forum. Good stuff! I have built my own kits. I have 2. Home kit: Tackle box containing patches, bore brushes, rods, eyelets, q-tips, solvent, oil, gp brushes, bore light, dental kit, 0000 steel wool, and rags. Range kit: Pretty much everything as my Home Kit just down sized. I use Birchwood Casey Barricade, Mil-Spec CLP (not Breakfree), Hoppe"s #9 Solvent and Oil, Gunzilla, and this new stuff called Zombie Blood. Same here on the boresnakes. I also use a foaming bore cleaner. It does a great job on the copper fouling. I ran across a reference to boresnakes breaking in the bore. Have any of you heard of such a thing? This may sound like a really stupid question but why doesn't everyone just use a boresnake? To me this looks idiot proof and the most simple way to clean. Don't they work as well as the old fashion way? Just watched some videos on YouTube and why would you make it any more difficult? Is it all about personal preference? A bore snake, cleaning rod and patches made out of old cotton T-shirts. Hoppe's #9 and windex.